In all my years of closely reading catalogs of kitchen equipment this is the first time I've ever encountered a dedicated avocado slicer. 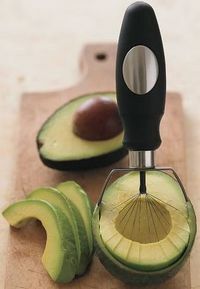 "Simply place this slicer at one end of a halved, pitted avocado and drag the tool along the interior of the shell." Drag and drop — hey, I can do that. "18/10 stainless–steel wires quickly create thin, uniform slices." Santoprene handle so you can get a grip. 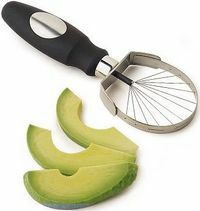 » Dedicated Avocado Slicer from OhGizmo! 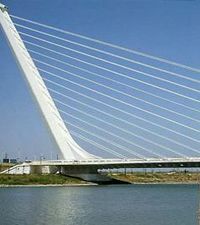 Could that be the Sundial Bridge across the Sacramento River in Redding CA? You can hit the cables and feel the difference in the wave frequencies. This is what geeks do with their summer vacations. Oh, by the way, the slicer looks nifty.